You are looking at one of the most beautiful and collectable Patek Philippe watches in the world. The Reference 2438-1 with a black dial is Ultra-Rare. 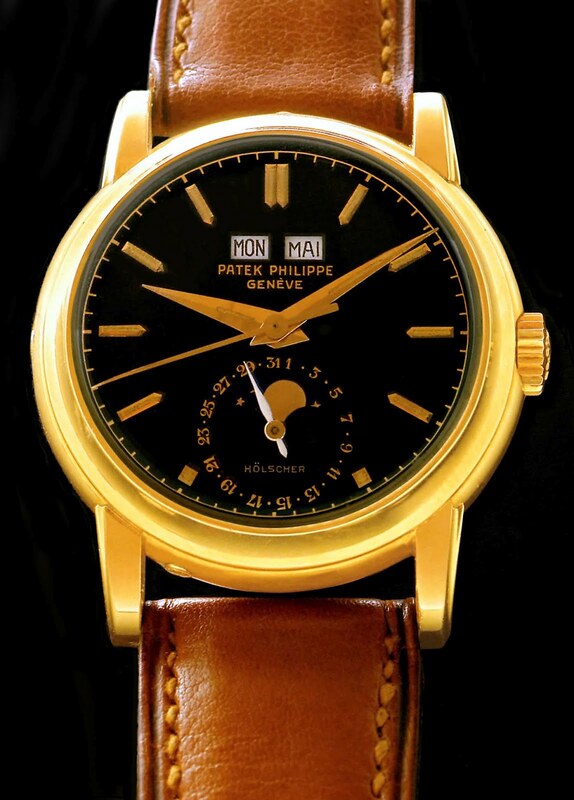 Complicated Patek Philippe Moonphase watches with black dials are very rare and beautiful. In my mind, black dials give the watch a sophisticated nighttime kind of vibe. This beauty has luminous hands and indices which are not easy to see in this photo. This beauty was originally retailed by Holscher, thus the designation under the moonphase. I believe this watch was manufactured and sold in the mid to late 1950s. One of the features that differentiate Jake's Patek Philippe World from any other Patek Philippe publication, is that I primarily publish watches I really like the design of, which is why I primarily publish images of complicated Moonphases. If you examine the banner at the top of Jake's Patek Philippe world, you will notice on the left side there is another black dial Patek Philippe Moonphase, because this is one of my favorite looking watches. The design and coloring of this watch just blows my mind!! !